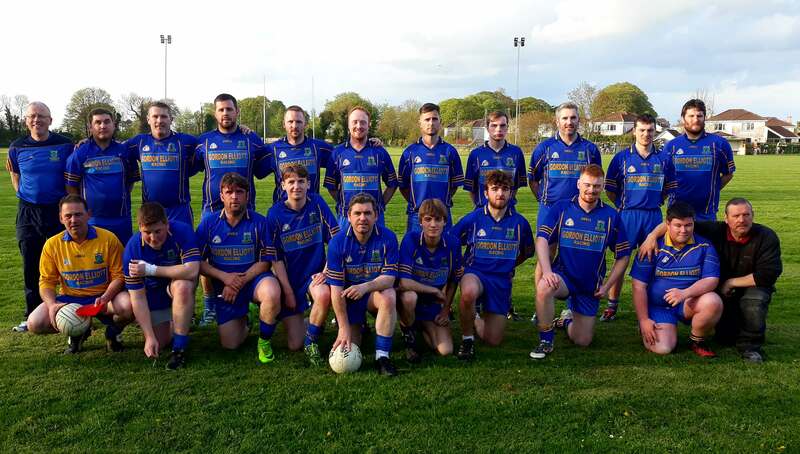 Summerhill 3rd team recorded a great win v Simonstown in Summerhill on Friday evening in Summerhill. The team put the disappointment of their loss in the 1st round of the championship coming out winners on a scoreline of 2-11 to 2-9. The team was a mix of a very small bit of youth but mostly experience, with men who have given great service to the club over the years like John Comey, Jackie & Jeremy Ennis, Stephen Lynch and Brian Rispin. The Summerhill lads got off to a great start with Taz Lynch finding the net within the first minute quickly followed by a Brian Rispin point from a free. Simonstown however recovered well to go in level at half time at 1-6 a piece. Simonstown started the 2nd half bright and raced into a 4 point lead and were well in control. Summerhill’s manager John Nangle then brought on his son Nathan and this turned the game around. The big man won a free straight away that was pointed. He then gave us a glimpse of the fancy footwork that recently won him the “Dangan Strictly Come Dancing” as he waltzed through the Simonstown defence before then been hauled down for a penalty that was cooly dispatched to the net by Brian Rispin levelling the game. From the resulting kick out Nangle was blacked carded for an over exuberant tackle on a poor unfortunate Simonstown defender. Nangle walked off with a “my work here is done” swagger and returned to the comfort of the dug out having spend less that 5 minutes on the pitch when he resumed his “banter” with the Simonstown bench. Buoyed up by Nangle’s intervention, Summerhill pushed on to close out the game winning by 2 points in the end. This was a great team performance with noticeable displays by Jackie Ennis who was imperious in goals under the high ball throughout. Connie McGrath made some fantastic catches around the middle of the fields and Taz Lynch worked tirelessly up front. Jermey Ennis relentlessly hassled and harried the Simonstown forwards and Brian Rispin was as accurate as ever from the placed ball. Team: Gary Gill, Jermey Ennis, Connie McGrath, Tommy Troy, Paddy Troy, John Comey, Sean Ryan, Sean Larkin, Richard Fox (0-1), Gavan Brilly (0-1), Cathal Brien (0-1), Ray Comey(0-2), Dylan Larkin, Brian Rispin (1-6. 1-0 pen,05 f) , Stephen Lynch(1-0). Sub: Sean Blackwell for Sean Larkin, Nathan Nangle for Stephen Lynch, Justin Ennis for Richard Fox, Sean Larkin for Nathan Nangle (black Card), Richard Fox for Dylan Larkin, Conor Burke for Tommy Troy.